flags; Promotional Flags and Custom Printed Flags and banners to promote your business or event! The Aussie Flag Factory Pty Ltd is an Australian owned and family operated business. We are based in Queensland but sell our flags and display products all over Australia. We are the originals. The Aussie Flag Factory Pty Ltd are the flag experts and are the home of the QUANTUM Swooper flag. The Aussie Flag Factory delivers the highest quality flags and display systems. There is a vast arrange of flag styles to choose from and our range is extensive. 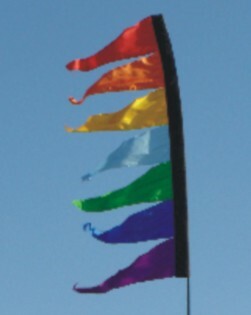 Flags, with their colour and movement, create an eye catching display. We have an extensive collection of quality flags to choose from, right here on our website. Buying is easy and secure, or if you wish to have custom printed flags or banners, please contact us. Many of our products are made here in our large premises, and for other custom printed orders we have a strategic allegiance with a large overseas printing company. We also sell Super Seller flags, bali flags, horizontal flags, 2 yard flags, custom printed flags, Bow flags, teardrop flags, feather flags, advertising flags, automotive flags, retail flags, banners and bunting, windsocks, air dancers and wind dancers, flag poles and accessories. We have a huge variety of flags to choose from as well as the accessories, pole sets and bases to suit. PLEASE NOTE! WE ARE THE AUSSIE FLAG FACTORY and NOT flagfactory .com.au that commenced trading with a similar name. We have been in operation since 2003 and this website since 2008.